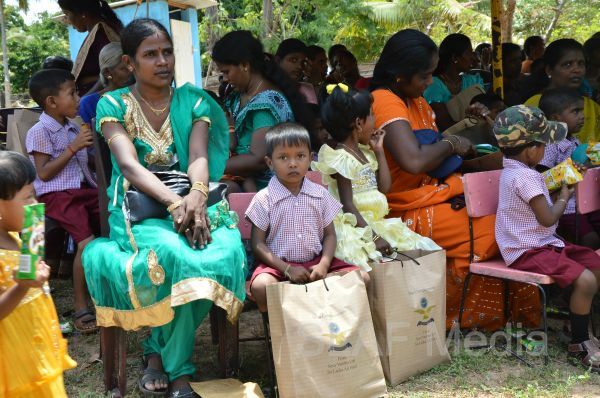 Continuing its community service in the North and East, the Sri Lanka Air Force (SLAF) donated school appliances and other educational aids for the children of 'Udayasooriyan' Pre -School in Mullaitivu at a function held on 20th May. The event was organized by the SLAF Seva Vanitha Unit. There are more than 50 children in the Pre-School and gift packs were distributed among them during the event. The gift packs included school bags, stationary items and school uniforms. A set of furniture was also donated to the Pre -School in order to ease it's much needed material needs. The SLAF took measures to refurbish the school which was destroyed by the terrorists during the war last year. Air Force officers, members of the SLAF Seva Vanitha Unit, and parents of the Pre-School children were present at the occasion.